TCA for hypoid and spiral bevel gears. 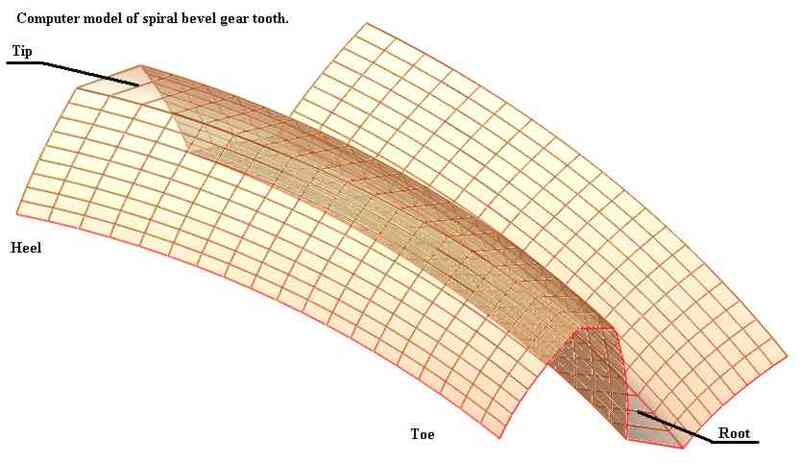 The author applies his new method for tooth contact analyses on spiral bevel and hypoid gears. The advantage of the new methods is low cost and high resolution. An experience gear professional can find many other advantages of the new method versus other TCA packages. Here are some calculation results obtained from the authors calculation method. 1. Gear cutting machine summaries are used as input data for calculation of gear and pinion tooth surface geometry. The new method is very flexible in graphical output. 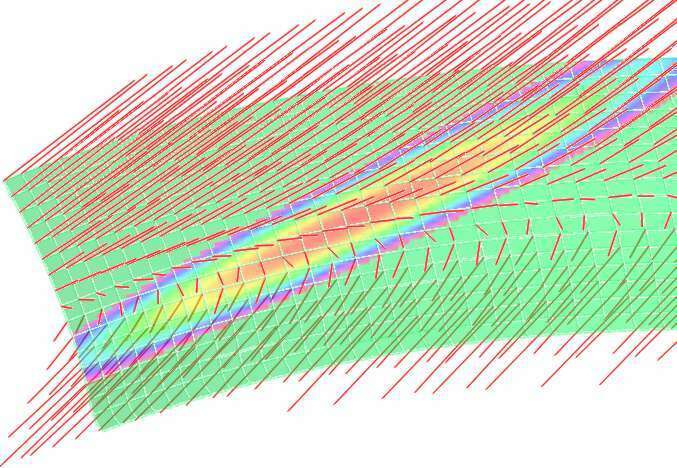 The calculation results are presented as 3-d models with high resolution. The resolution and quality of graphical outputs in the existed, so-called state of the art software packages are underestimated. In general the resolution and the quality of graphics in engineering CAD packages is constantly improving. The old gear calculation products need to be updated as well. 2. Tooth Contact Analyses (TCA). 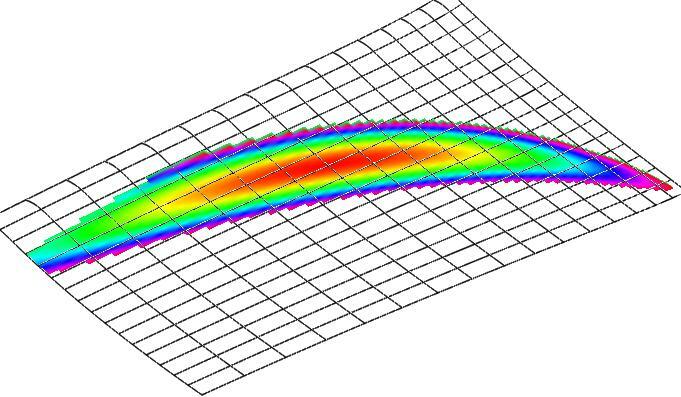 The new method calculates distances between the meshing surfaces in a number of poins in order to provide a quality representation of the combined contact. The co-ordinates of the points on the tooth surface can be calculated from the gear cutting machine settings or by mesuring of a real gear on a CMM (reverse emgineering). The distance between surfaces is shown in different colors. The colors are set in rainbow sequence. The red color in set in the point where the distance between the surfaces is equal 0. The 3-dimentional models of the gear tooth can be shown in rendering or in wire frame. The gear, the pinion and the contact pattern can be seen in one assembly in the same time. The image below has the gear tooth surface shown in 67% of transparancy so it is easy to see both surfaces on the same image. The contact pattern imaged shown above are not the same contact patterns that one can see on a real gear set after the set was rotated and the contact moved over the tooth surface. The image below shows the contact simulation on a rotating gear set. The combined contact pattern is calculated as a summ of the elementary cntacts on different angular positions of the gears. Different imcriments of rotation can be selected in order to obtain different combined contact images. 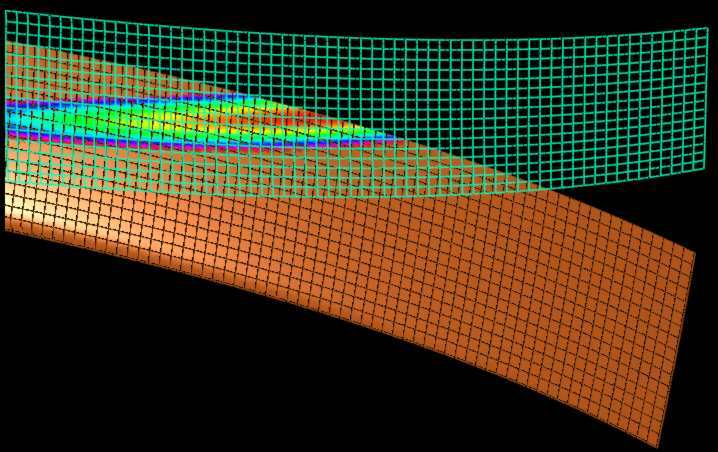 Because of the high resolution of the new method it becomes posibble to calculate areas covered by different colors on the 3-dimentional contact model. The following outputs can be helpful for gear noise, lubrication and driving effitiency analyses. The black lines on the picture are tangent to the gear tooth surface. 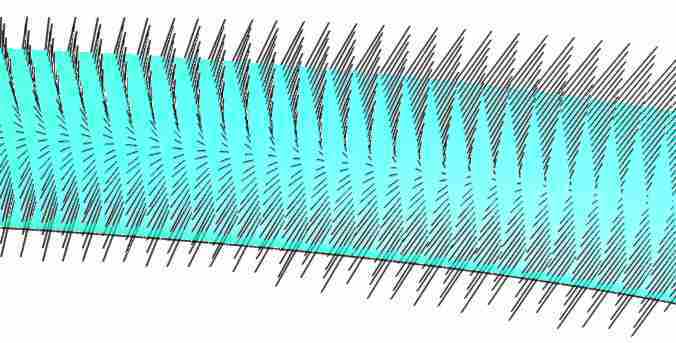 Each line represents direction and value of sliding velocities between gear and pinion tooth surfaces. The red lines show directions and velocities of approaching the pinion tooth surface to the gear tooth surface. The driving efficiency can be calculated very accurate for each angular position of the rotating gears. The author proposes to calculate the driving efficiency as a sum of driving efficiency calculation on each cell on the gear tooth surface. 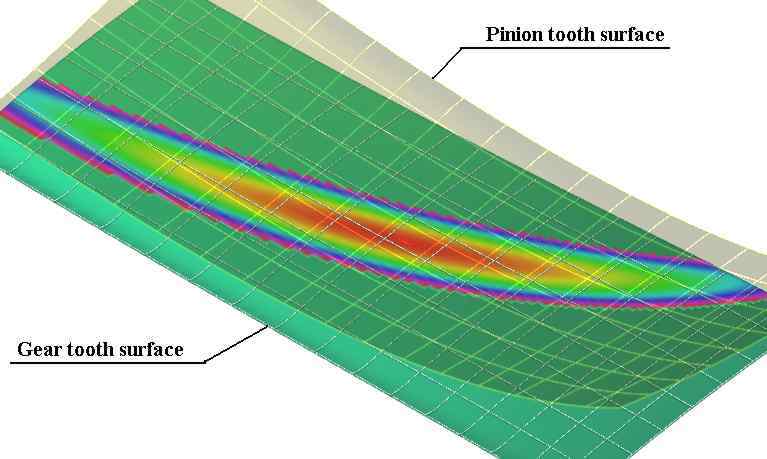 The new method of simulation allows to calculate sliding direction and friction on each cell on the tooth surface and for each position of the rotating gears. The author has conducted the driving efficiency calculation for different designs of spiral bevel and hypoid gears. Different methods of improving of driving efficiency on hypoid and spiral bevel gears are discovered.